Sean Banning and his wife Beth are the proud owners of Banner Water LLC. Both Sean and Beth were raised in Tolland, CT and have lived in town most of their lives. Having worked together for twenty years, they decided to open a business of their own and focus their attention on working in the community where they were raised. They worked diligently, fully believing in their own work ethic, their commitment to customer satisfaction and belief in community service. Banner Water was started by going door to door, house to house, building the business one customer at a time. Support from local residents and referrals from satisfied customers has made Banner Water the most respected water pump, treatment and radon mitigation company in the area. Banner Water has always been dedicated to community service, wanting to give back to the community that has given them so much. 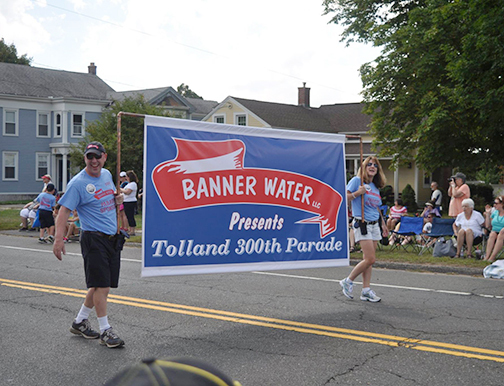 Over the years Banner Water has donated more than 120,000 bottles of water to non-profit, civic and community organizations. The company annually donates food and gifts to the Care and Share holiday program. Banner Water truly appreciates the community in which it serves. Sean and Beth have a passion for the work they do. They have made a commitment to hiring honest and dependable employees that have the same integrity, commitment and loyalty to the customer that has made Banner Water successful. Sean Banning has been servicing all types of water filtration systems, pumps and tanks in the area for over twenty years. He has made it a priority to ensure we are the most skilled and appropriately licensed company for plumbing, electrical and radon mitigation. Sean is licensed in Plumbing, Piping, Home Improvement, Radon Measurement and Mitigation. Sean has built his business on his reputation and referrals. We strive to gain your respect, your business and your referrals. We offer only the top quality water treatment and radon mitigation systems available. We guarantee 100% satisfaction of our products and services. Banner Water is a leader in water treatment and radon mitigation. We strive to accommodate our clients needs as well as to provide solutions for all well water problems and radon issues.